As you might already know, UruShop is a company specialised in Yerba Mate and Chimarrao (or erva mate in Portuguese) to avoid confusion, in this blog we are going to mention chimarrao as “Brazilian mate” and yerba mate as “Argentine Mate”. Yerba Mate is an iconic drink in a large part of South America, however, in Brazil, this drink is slightly different than how it is in Argentina or Uruguay. Here we will discuss the way erva mate is most commonly drunk in Brazil – the drink known as chimarrão. In Brazil, like in most of the countries in southern South America, erva mate is a cultural legacy coming from the “Gaúchos“, this word in Portuguese carries the same original meaning it does in Spanish. It refers to the ranchers and cowboys of the pampas of the region, and it is known as someone “Tough” or “Strong“. Brazilian Mate is slightly different than Argentine mate, Chimarrao is more like Matcha green tea than yerba mate. One of the most distinctive difference is the colour, Brazilian mate has a brighter colour, while Argentine mate is darker. This is mostly because yerba mate is processed for years and erva mate, as soon as it is harvested, it is ready to drink. 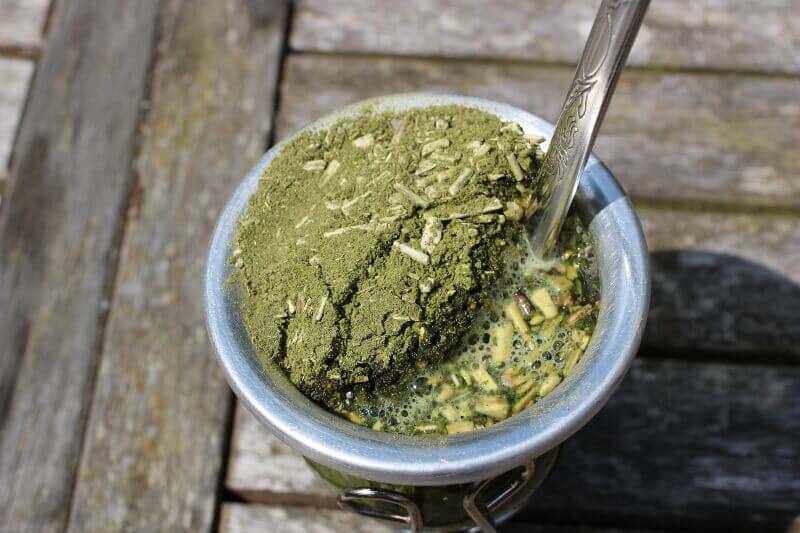 This makes Brazilian mate have a marked grassy and natural flavour that Brazilians love. Yerba Mate has a lower dust content than erva mate and has smaller stems (Or can be without stems). 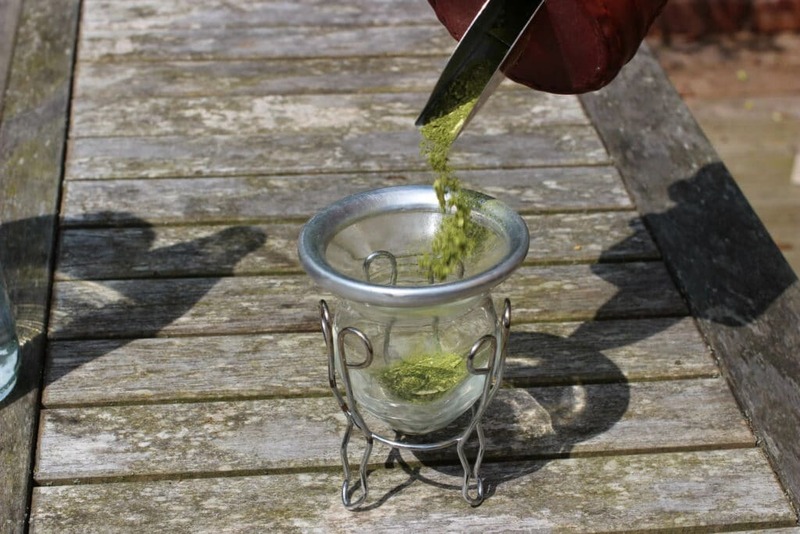 Bright green in colour, Erva mate is a mixture of extremely fine powder and very large stems. Why is chimarrao so good? Well, there are lots of benefits on chimarrao and yerba mate that I will number later. Not only this tea is incredibly good and healthy for your body, it also makes people from South America like myself, feel at home, remember the moments you spent with your family or friends when you were there, that is something that I personally love about Mate mainly (Because I’m from Uruguay) But I bet it feels the same with chimarrao and Brazilian people or Tereré and Paraguayan people or also to people that traveled to any of these southern South American countries and fell in love with this amazing tea. Luckily UruShop is here to fulfil all our South American needs! Chimarrao contains caffeine, (also referred as mateine) which makes mate a good energy source. Due to its bitter flavour, people that drink yerba mate often feel that they eat fewer snacks than what they normally would. We can see that Argentine Mate and Brazilian Mate are very similar, how they look and how they are prepared, the materials needed for this are the same or really similar but different. Here we will list and describe all the needed and optional materials to prepare the perfect chimarrao the traditional way. Brazilian Bomba: The Brazilian Bomba is really similar to the bombilla, it is slightly bigger and has a round-headed filter. Giant Cuia Gourd: The Brazilian cuia is quite different than the Argentine calabash, neither one is better or worse, they are both different and both may fit your style. It’s a matter of cultural identity and preference. The cuia gourd is normally higher quality because it is thicker than the Argentine calabash, the Brazilian cuia gourd is also bigger, this big difference occurs when the mate calabash is cut. (Optional) Gaucho Bruno Flask: Stainless steel high-quality Gaucho Bruno flask is always a good option. This will help you keep your water warm and you will be able to enjoy your Chimarrao for way longer! (Optional) Leather Matera: This Matera is perfect to carry your mate and flask and the extra accessories, it is also really helpful if you enjoy drinking mate in your car. (Optional) Bombilla cleaner: A bombilla cleaner (limpia bombilla) Is incredibly helpful because the Brazilian bomba is big, this makes it different to clean without a brush that can get inside the bombilla. That is why the limpia bombilla is incredibly handy. As you can see, everything in Brazil is bigger and better. With all these materials you will be able to drink your Chimarrao the traditional way. Luckily, we have all these items in our shop! How do I prepare Chimarrão? Chimarrao is like yerba mate, the preparation is not as simple as tea and different changes while preparing it may make the actual flavour vary a little bit, however, after you made it and drink it you can see that it is definitely worth it! Luckily we made a blog explaining how to brew the perfect chimarrão. There are a lot of pictures and detailed steps so you can learn how to prepare it and enjoy it with your family and friends.Let’s keep this beautiful culture growing! We look forward to seeing pictures while preparing it and drinking it. We always love to see our happy customers drinking and enjoying their Mate/Chimarrao.